The Association of Garda Sergeants and Inspectors says it will fully support its member who is under Garda investigation. The National Bureau of Criminal Investigation is investigating whether the Garda engaged in outside security work which gardaí are not permitted to do. The investigation commenced after two other gardaí made protected disclosures. The General Secretary of the Association, John Jacob also says the Garda under investigation is entitled to anonymity and due process should be allowed to take its course. Two of the Association's most senior officers, the Deputy General Secretary, Antoinette Cunningham and the Vice President, Paul Wallace have decided not to go to conference after it emerged one of the members was under investigation. RTÉ News understands both are unhappy with the way the matter is being handled by the Association. However, Cormac Moylan, the President of the AGSI, which represents middle ranking gardaí, says it is dealing with the issue in the appropriate manner and that the AGSI member should not be asked to step aside. The Association also insists the issue has not cast a shadow over the conference or over the members attending here who have serious issues to discuss including training, welfare, resources and clarification on the role of gardaí attending evictions. General Secretary John Jacob has also strongly criticised the Policing Authority for what it says is unfair criticism of the gardaí and has rejected its assertion that the gardaí over promise but under deliver. The Minister for Justice Charlie Flanagan is due to address the conference this evening. Earlier, John Jacob told RTÉ's News at One programme that the AGSI did not know the details of the allegation or who was under investigation. "The Association has not been informed of a formal investigation or any particular individual who is being investigated," he said. "But we have to believe the media reports that one is taking place," he added. He did not accept there was a cloud over every member following the allegations and said it would be wrong to name an individual, particularly when that person has not been been formally notified. "The person who is being allegedly investigated is entitled to anonymity and it would be only fair that due process is allowed to take its place. "It would be up to an individual themselves to decide if they want to come forward," he added. He said it was important that the Garda organisation fully investigates the reports. Asked for his personal view on gardaí who take on additional work outside of their role with An Garda Siochána, Mr Jacob said: "If they're involved in extracurricular work it's up to the Garda organisation to examine that, investigate it and report on it." 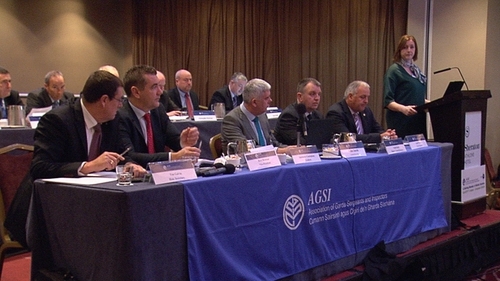 The AGSI issued a statement last night after its National Executive held a three-hour meeting. It confirmed the association was aware of the allegation but said the garda had not been formally notified of the allegation or the investigation. It is not clear why the AGSI is making this point in the statement because it is not usual for gardaí to notify suspects in a case that they are under investigation. Meanwhile, in a separate development, Mr Jacob strongly criticised the Policing Authority for consistently focusing on what the Garda does not achieve rather than what it does. He said An Garda Síochána is "an easy target" for the authority which then criticises it when it fails to deliver on the authority's expectations.